The food truck pilot project at Surrey City Centre, running for the rest of the week, shows the potential that having a proper urban core brings to the city. Food trucks need high amounts of food traffic to be sustainable – hence their prevalence in downtown Vancouver. But that also doesn’t mean that food trucks couldn’t work in Surrey.There are plenty of trucks in the US that set up in cities that aren’t the most pedestrian-friendly. Very successful food trucks in LA, for instance, keep their followers up to date through twitter. Imagine food carts roaming Scott Road, or setting up shop at Guildford. I’m a big fan of the growing food truck scene here in Dallas (probably the most pedestrian-unfriendly city in the world). If you build them, they will come. Thanks for stopping by, Bill. What have been the keys to success for food trucks in Dallas? And do you think its pedestrian-unfriendly status will continue? One key is the fact that a large portion of the brick and mortar restaurant community (which wields a lot of power) realized that the trucks are not competition and in reality they will get more people used to eating out. The other key is the use of twitter and facebook along with smartphones to allow the public to find the trucks as they move around the city. Dallas is working hard to be more bicycle and pedestrian friendly but there are two big problems. One is that the city is extremely spread out – though the DART rail system is helping with that (I am seeing a lot of bicycles on the trains now). The biggest hurdle is the Texas summer, however. For four months of the year it is simply toxic to be outside for extended periods of time. Heat is definitely not a problem in Surrey! 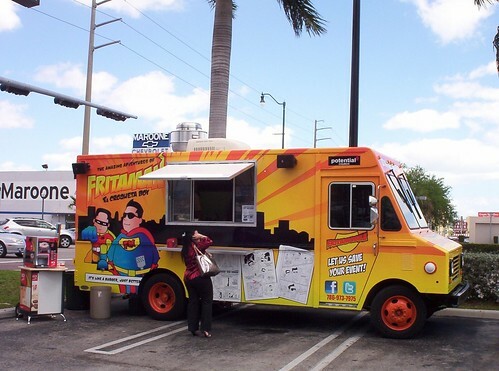 Any recommendations for food trucks, should one of our readers ever venture down your way? Ssahm (Korean BBQ) or Nammi (Vietnamese Sandwiches) are very good and popular. Rock and Roll Taco, and Easy Slider are especially good too.